Transport Tin Sign: If you love classic modes of transport then they don't come much more iconic than the Flying Scotsman. This wonderful tin sign features the London and North Eastern Railway locomotive as it runs along the tracks in the hazy afternoon. The Class A3 Pacific is one of the most famous trains of all time and as of its retirement date in 1963, it had covered 2,076,000 miles of British train track. So why not invest in an icon of transport and hang this sensational tin sign on your wall. 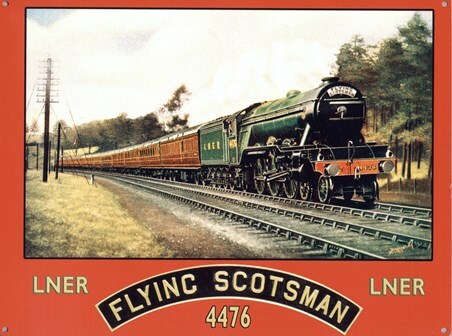 High quality, framed The Flying Scotsman, Vintage Railway Advert tin sign with a bespoke frame by our custom framing service.